Title: The introduced fishes of Nevada, with a history of their introduction. Title: Notes on mosquito fish in Utah, Gambusia affinis (Baird and Girard). 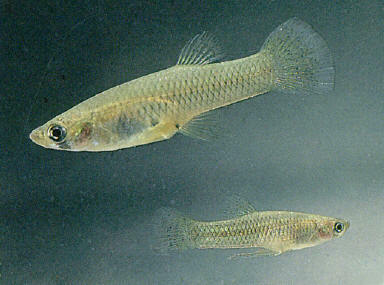 Comments Miller and Alcorn 1946 provide evidence that original introductions in Nevada were Gambusia affinis, the western mosquitofish (stock source: Southern California, which originally came from Mississippi (Rees 1934)). Found statewide in warm springs.